Exmark Lazer Z E Series Zero Turn Rider LZE751GKA604A1 comes equipped with a full suspension seat that enhances operator comfort and a heavy-duty steel unibody frame. The Kawasaki V-Twin engine couples with the UltraCut Series 4 cutting deck to deliver unmatched power and efficiency. 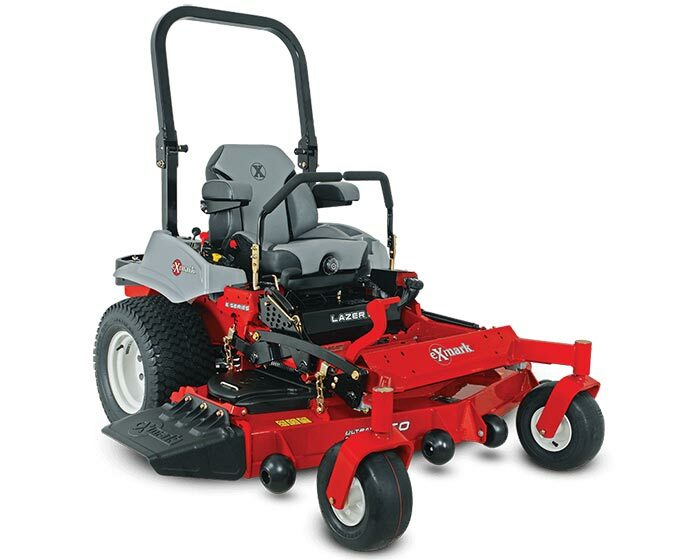 With hydraulically dampened twin levers and a foot-controlled deck lift, this zero turn is perfect for professional landscapers looking for innovative engineering and commercial-grade quality. Additional features include a digital operator diagnostic module that simplifies system monitoring and troubleshooting, and a fuel gauge that uses ultrasonic waves to provide a more accurate reading. Transmission Type : Two Exmark exclusive Parker unitized pump and wheel motor systems with no hoses, integrated cooling fans, shock valve, 1.7-quart integrated reservoir, spin-on filter and heavy-duty components. 12 cc pumps and 14. 5 cubic inch motors.